Here in Egypt, we match the accommodation to the country itself - diverse and incredible in equal measure. 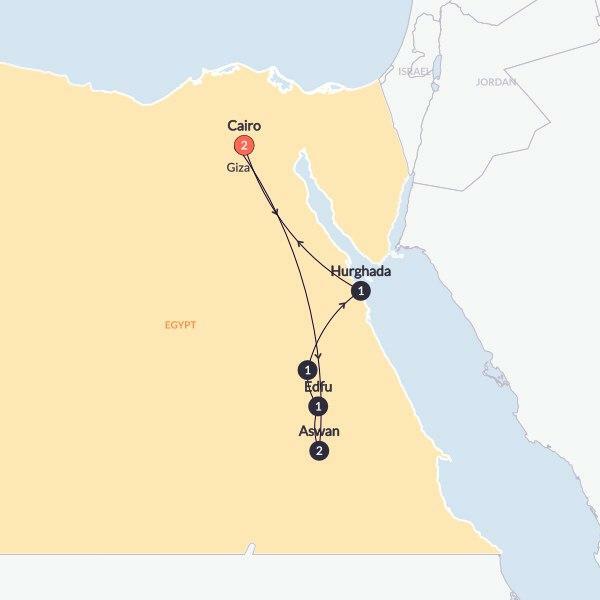 3-nights will be spent in swanky hotels, 1-night on a couchette train riding twin-birth from Cairo to Aswan, & 3-nights will be spent cruising down the Nile, no less. Not familiar with Egyptian cuisine? You will be, and you'll be uber impressed might we add. We'll sort you out with 7 continental breakfasts to kick start each day of adventure, 3 lunches, & 5 dinners. The rest of the time you can stretch the waist of your pants overstuffed shortbread biscuits, tahini salads & eggplant moussaka. Throughout your trip you'll be safe in the hands of an expert local guide, who knows the streets of Egypt and the history of the Pharaohs better than you know the depths of your bucket list.